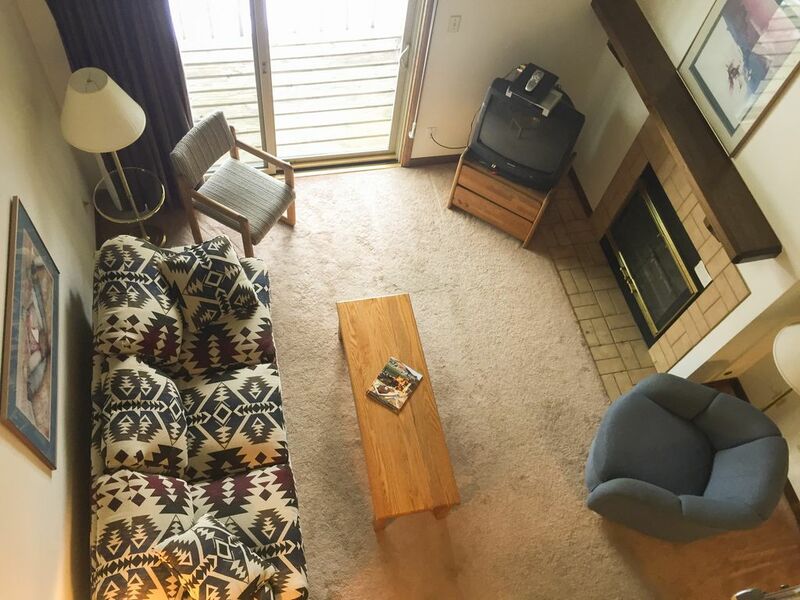 Our cozy family condominium in the Shadow Run complex is just minutes away from the ski slope via FREE bus service. The bedrooms are arranged for a number of family configurations. There is one king-size bed, one queen-size bed, and a larger upstairs sleeping area that accommodates five in bunk beds. More sleeping accommodation is available on the main floor in front of the fireplace on the queen-size sofa-sleeper. The open living room/dining area accommodates family groups. The unit is two stories with nice views of the mountains and ski slope. It is on the top floor of the complex so there is no noise from anyone above. The Steamboat Springs ski resort is known as a family-friendly ski area. They offer a kids ski FREE program and have extensive ski school programs for kids. The town of Steamboat Springs offers a large variety of unique shopping and restaurants. The extensive bus service in Steamboat Springs is FREE and frequent and will take you anywhere you want to go. We own and manage our condominium and are able to save you money. This condo was perfect for our group of eight. We were very close to the mountain and had everything we needed during our stay. Exactly as pictured/described and worked great for 8 adults for the weekend. Beds were comfortable. It is right on the free bus line but is walking distance to the mountain (less than a 15 min walk). This condo is in a great location. Really close to the base of the mountain. The condo is very dated tho. I did not think this would be a problem because of the people staying with me were not fancy or in need of nice accommodations. This did become a problem when a maintenance worker from the HOA informed us that our toilet was leaking in to the downstairs condo and we could not use the toilet for the rest of our trip, another 2 days. This left us with only 1 working toilet for 9 people, which wasn't ideal. On top of that, one of the fuses must of blow because they microwave and many wall outlets quit working soon after we arrived. I was not able to find the junction box to reset the fuse so we had to just do without. I would of loved to just settle this with the owner and not over a review, but he has still not responded to my email 8 days latter. We didn't come for a luxury vacation. We came to ski, hot tub, eat, and sleep. All of those things were made incredibly easy by staying here: free shuttle right out front, great jacuzzis, sufficient kitchen space to prepare meals for a large group, and plenty of beds to choose from! There is a lot of sleeping room with 2 separate bedrooms and a loft with 2 sets of bunk beds. The closed doors are welcome for those that snore. The shuttle stops right at the parking lot, which is great. The unit is on the third floor so suitcases and gear need to be carried up. A very comfortable spot after playing on the mountain!